Just in time for summer, San Diego's two-story The Hub at Hillcrest Market has a line up of new, exciting spots. The center recently added indoor cycling studio, CycleBar, and Whistling Duck Tavern, an industrial-chic eatery that touts Asian-fusion bites and an array of craft beers. The chef is from San Diego but his father is from Hong Kong. The duo created a menu that is the best of traditional Asian flavors while incorporating a west coast sensibility. Coming soon is Rolled Up, a sushi burrito eatery that is slated to open next month. Its founder comes from pizza beginning — he is the founder of build-your-own Mod Pizza, Pieology and Project Pie. Rolled Up isa new fun venture for him and will offer giant hand-held sushi rolls and specialty fusion rolls. 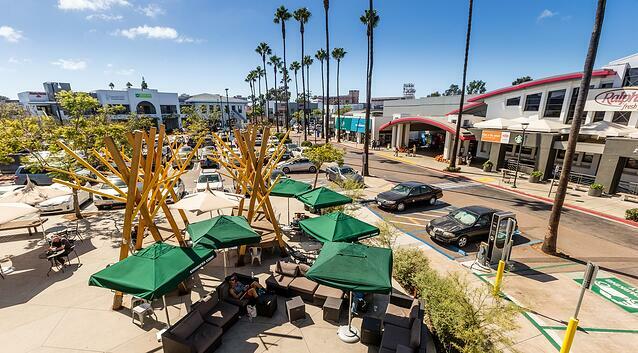 The 148,938 SF center is located in San Diego's eclectic, urban Hillcrest neighborhood. Regency acquired it in 2013 and incorporated colorful murals and modern details. "The goal was to create a unique lineup of restaurants and different offerings that you wouldn’t find at your traditional grocery-anchored shopping center. I think the residents are just now beginning to experience the fruits of Regency Center’s labor over the last few years." To follow the center on social media, click here.